Though the idea of automatons had been present in mythology for centuries, the term “robot” wasn’t introduced to the public until R.U.R. (Rossum’s Universal Robots), written by Karel Čapek, debuted at Prague’s National Theater in 1921. His play popularized the term, but Karel credits his brother Josef, a noted Czech painter, with its invention. The word comes from the Czech robota, which translates to corvée, the type of uncompensated labor demanded by a feudal lord. Interestingly, Čapek’s robots are not the purely mechanical creations we think of today, nor are they androids (mechanical creatures resembling humans). Rather, they are biological entities grown from the “phlegm of a colloidal jelly” to be a sexless, unquestioning underclass serving humanity’s whims. Predictably, the utopian vision goes unrealized as conflicting human interest collides with the awakening of robotic thought and feeling. Nearly a century later, at Carl Solway Gallery, located in the West End neighborhood of Cincinnati, technology emerges as the focus of three concurrent solo shows. 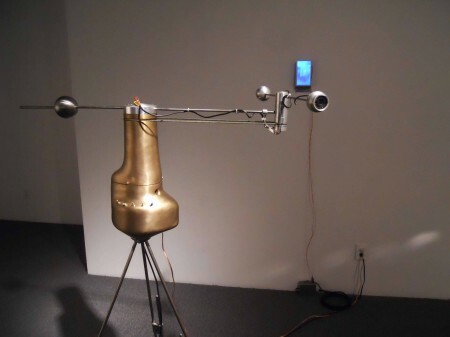 Here, however, the exhibited work departs from Čapek’s dystopian vision of biological automatons and embraces both the mechanical and digital technology that has become an intrinsic part of 21st Century life. 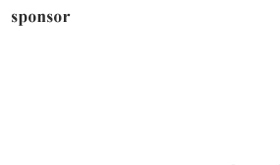 Here, the ethical dilemmas facing the humans of R.U.R. become irrelevant, and we are instead free to examine the one-sided ethics of technological dependency (freeing ourselves from our smartphones without feeling obligated to free our smartphones from us). The work on display ranges from light design to filmmaking to robotic—mechanical, not bio-imitating—surveillance. Each show enables us to see technological achievement improved upon, made art. 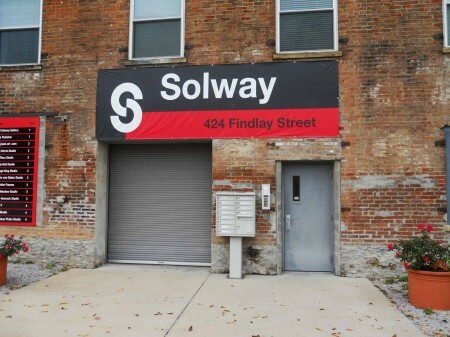 The gallery sits in a historic warehouse to the west of Central Ave, about a ten minute walk from Findlay market. Once you get buzzed into the building you walk through an industrial lobby and through a pair of doors on your left. The main floor of gallery features three distinct rooms separated by a central hallway. The featured artists—Erwin Redl, Pascal Dufaux, and Rachel Rampleman—each occupy their own space. Though these are solo shows, their proximity makes it difficult not to search for connection, for the tendrils that bind a group show together. Asked about these connections, gallery Director Michael Solway says, “When you work with artists and plan exhibitions you have some general understanding of how the gallery will look, but in the end there is always some real magic that happens when the works are installed and visual conversations begin to occur that often are wonderful surprises.” He also explains that the role of a curator is to seek out the conceptual or tangible similarities in artwork and to showcase them as “deliberate bridges,” as was the case with the three current shows. Erwin Redl’s exhibition, featuring work created between 2010 and 2015, fills the gallery’s first room. Two walls feature LED light sculptures. To the left, Benchmark (line 23), a massive 21.5 x 4.5 foot piece, occupies the whole wall, continuously changing color in slow waves. 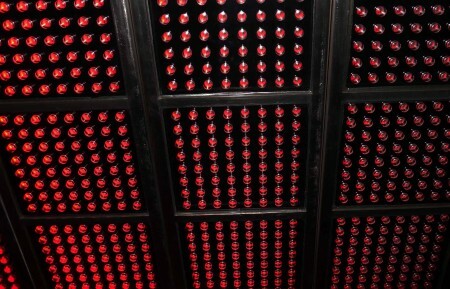 Its twenty-three RGB LED panels are framed in stainless steel, giving the installation an almost ruthless industrial feel. Straight across from the entrance are three pieces from an edition of ten titled Dial white-red, white-blue. 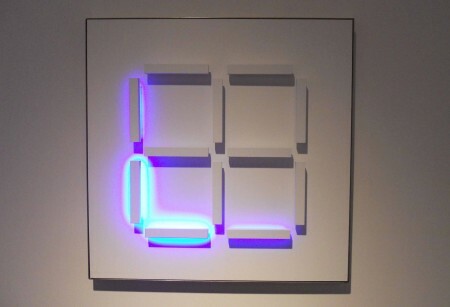 The pieces, which Redl refers to as “light paintings,” feature two white-red and white-blue LED-dials, consisting of a center pole surrounded by eight bright LED lights. In these pieces, the color change is overt, much brighter, producing a shadow that rotates 360° each cycle. 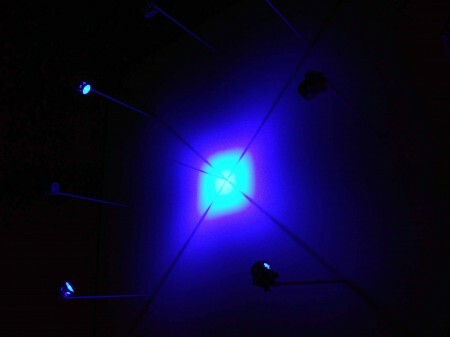 Parallel to the LED pieces are two kinetic sculptures implementing fans and ping pong balls. Ascension (line 24) is the largest of these, consisting of twenty-four LED-lit glass tubes. Hidden fans at the base of each tube activate at predetermined intervals, suspending the ping pong balls in air then dropping them, creating a rhythmic, almost soothing whoosh and plunk with each rise and drop. 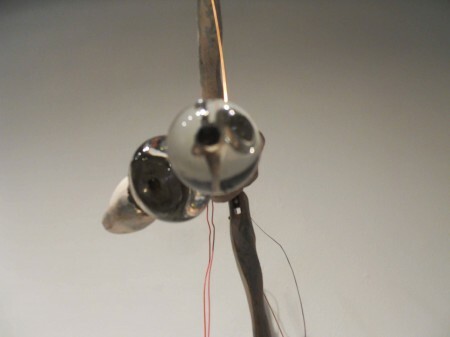 To the right of this piece is Inclined Plane (one over waves), a much smaller piece in which a ping pong ball is blown back and forth between two fans on a suspended piece of wood. This is the most diminutive three-dimensional piece in the exhibit, and the least successful. While the movement of the ping pong ball is playfully amusing, the piece lacks the almost science fictive quality of its larger neighbor, as well as the hypnotic pulse of light emitting from the other installations in the room. Several of Redl’s pieces are difficult to imagine outside of the gallery environment. Large installations like Benchmark (line 23) and Ascension (line 24) draw their power mainly from size, but it’s the smaller LED pieces that are most alluring and conceptually engaging. His two-dimensional offerings, CNC Palimpsest Prints and Random Progression—a series of seven drawings, are less captivating, and feel disconnected from the other pieces. Collectively though, Redl’s work serves as a tribute to our digital century, without fawning over that particular technology. His pieces combine minimalism, light design, and programming to chronicle our technology-driven world, to explore it, and to shape it. To the right of the vision machine are three wall-mounted pieces, titled Vanity No. 1, Vanity No. 2, and Vanity No. 3. These mixed-media pieces seem pulled from some post-apocalyptic future, mixing video cameras with epoxy, fiberglass, and glass. Here too the question of “Who watches the Watchmen” is answered as viewers are presented with small screens on which they may observe themselves being filmed. There’s an equal sense of humor and foreboding in these pieces, as the novelty of being filmed is replaced by the knowledge that this filming will never stop. Another piece, titled Alien Forms, features a number of small sculptures on a freestanding metal shelf unit. The sculptures, which are made from plaster, marble, porcelain, and glass, are mildly interesting but don’t hold up to the other pieces in the show. Further confusing things, a single monitor placed on the shelf shows a blurred close-up of what looks like a porcelain sea shell. The vision for this piece seems a bit jumbled, and the collected pieces—I counted eleven, not including the camera—never quite became a unified whole. Regarding his greater body of work, Dufaux has found himself drawn to the Situationist “Theory of Drifting,” a process by which subscribers drop what they’re doing and allow themselves to be pulled forward by the unknown. Dufaux says that his work with the vision machines has allowed him to experience “drifting” in a geographical sense, when he is placing the machines at an unknown site, and also perceptually, when he is reviewing the footage later on. Because the machines aren’t drawn to humans, or to any particular action, the anthropocentric bias is all but eliminated. By viewing his collected footage, Dufaux is exposing himself to an alternative viewpoint, one that reveals the “hidden reality” behind the world he knows. 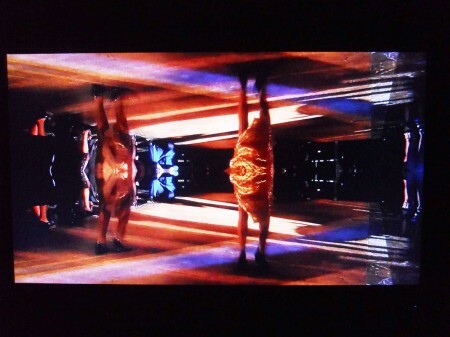 The final exhibit, featuring looped videos by Brooklyn-based artist Rachel Rampleman, takes up two separate rooms. 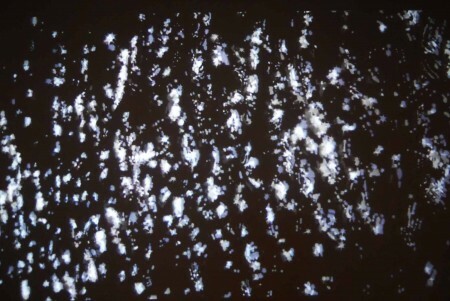 In the first, to the right, Water/Light Study is projected onto the wall, accompanied by a soundtrack playing a static crackle over low rhythmic sounds. The video’s footage is a result of a hike through the Hudson Valley, where Rampleman and her partner find respite from New York City, traveling with a vintage Airstream that she refers to as her “country studio.” Rampleman says that she was walking alongside a pond “one breezy and warm spring morning,” and became “struck by the play of light on the rippling surface of the water.” She describes the piece as a documentation of the light “refracting and bouncing off of the pond’s undulating surface as the breeze picks up and dies down over a few minutes’ time.” Overlaying the tranquil water scene are frenetic clusters of Disney-esque stars that crackle and fizz, merging with the water and then re-emerging to herald the arrival of a fairy godmother who never does appear. Rampleman’s final piece, located in a small room behind the Berkeley wall, is titled Bellmer Burlesque. 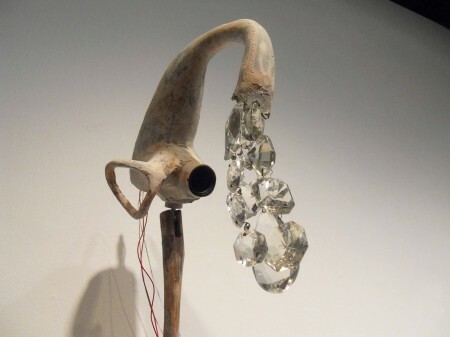 The name is a tribute to Hans Bellmer’s rather horrifying doll sculptures which, while sexualized, tended to feature limbless torsos, conjoined bodies, and severed heads. Rampleman describes herself as being “a bit shocked but utterly intrigued, kind of simultaneously slightly offended and totally bemused” when she first discovered Bellmer’s work. However, she also describes Bellmer as her “introduction to the uncanny.” Several years later, while experimenting with footage of a pair of burlesque dancers, Rampleman discovered a technique that allowed her to halve and mirror the dancers, literalizing the expression “she’s all legs” and, in effect, recreating Bellmer’s La Poupée in video form. This context is essential to the piece, which exists otherwise as an absurd but undefined scene playing second fiddle to the pieces that preceded it. In presenting these three concurrent solo shows, Carl Solway Gallery has positioned itself firmly in the 21st Century. Though each artist makes use of distinct methods and materials, and though they had never met previously, their work picks up a conversation that has been ongoing for millennia. Influences from the past merge with present technology and technique to produce a vision for the future. It is a conversation that will last as long as the creative spirit lingers in the cosmos. It is a bridge that connects all people, all territories, all experience. The joy of art is fundamentally tied to a sense of discovery. 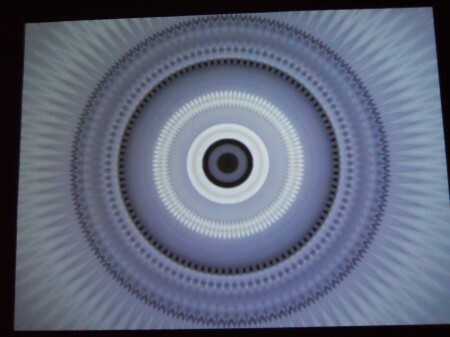 These shows, which introduce their viewers to the concept of light paintings, to vision machines, to 2.0s and even 1.0s, all offer this sense of newness, of discovery. So go, see them as separate or as part of a whole. Go forth and discover. The three solo shows featuring work by Rachel Rampleman, Pascal Dufaux, and Erwin Redl opened on October 9th and will run through December 23rd at Carl Solway Gallery, located at 424 Findlay Street, Cincinnati, OH 45214. For more information, you may visit the gallery’s website at http://www.solwaygallery.com/.